With a bounty of ingredients for my cookie baking mission, I have no excuse but to take care of business at hand. It’s not a difficult recipe but not an easy one either considering I have to make a double batch- probably three. Yeah I intend to fully sate Mr. Cookie Monster Jr. or give him a stash to last a while. 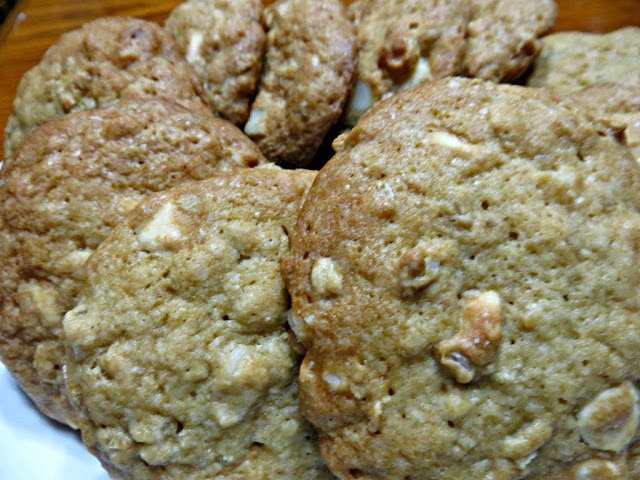 The recipe is adapted from my Almond Toffee Crunch Cookies and after tasting one- I realized, it’s just as good. 4. Using an electric mixer, beat the butter and sugars in a large bowl until fluffy. 5. Beat in the eggs and vanilla. Add the flour mixture and stir just until blended. 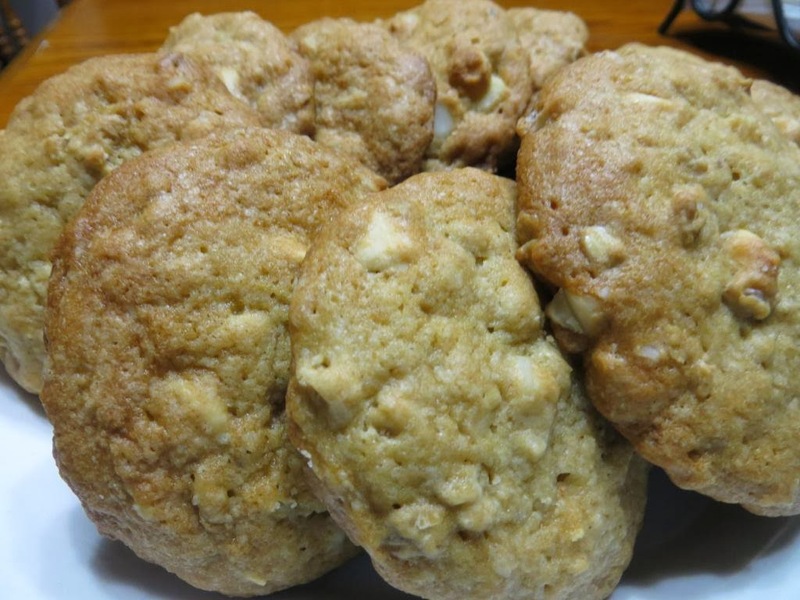 Stir in Macadamia nuts, old fashioned oats and chocolate chips. 6. 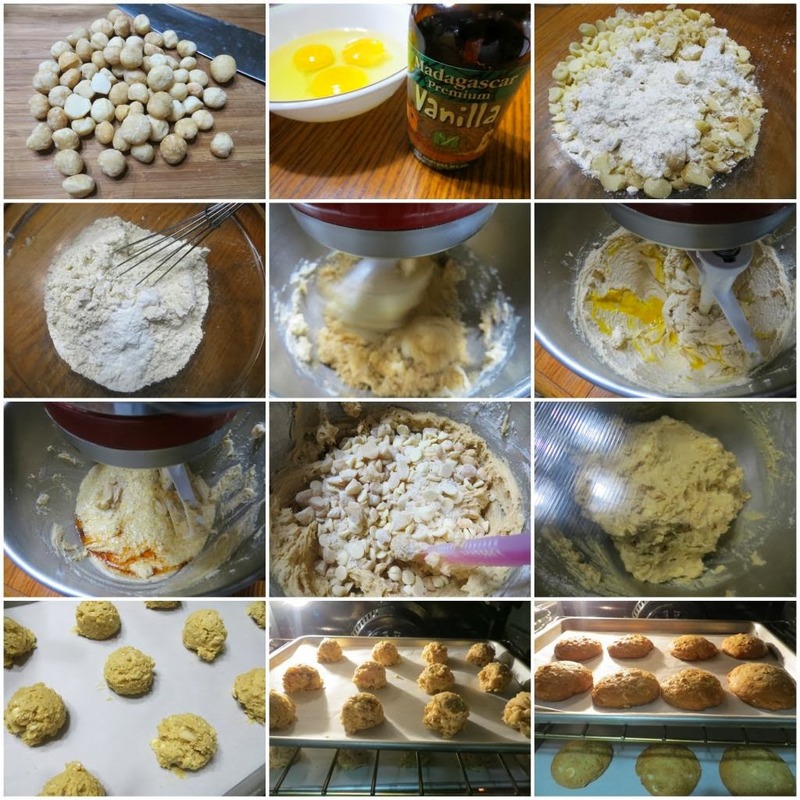 For each cookie, drop 1 rounded tablespoonful of dough onto sheet, spacing 1-inch apart (do not flatten dough. The cookies will flatten slightly on their own as they bake. Bake until the cookies are golden about 16 minutes. 7. Cool the cookies on the baking sheets for 5 minutes. Transfer to a cooling rack and cool completely. NOTES: I freeze the dough for a couple of hours to make it firm. The dough tend to spread resulting in flat cookies when the dough is soft. I use a large ice cream scoop instead of regular spoon and the result is round, plump, chunky cookies. For Mr. Cookie Monster Jr. I asked Ms T for some feedback but didn't get much. Just that little brother didn't want to share his cookies. I pretty much anticipated that and baked extra for her and her girls. I'm on a cookie baking mission! And my fig has a little baby!